I’m happy with that idea. I think it is important not to be explicitly OfSTED driven and that’s been my approach at Highbury Grove so far. However, if I want it to be true that our standards and expectations are as least as high as OfSTED’s it’s important to know what they’re saying. Here I’ve simply compiled all the Outstanding descriptors taken from the September 2015 Handbook as a handy self-evaluation tool for me to use. 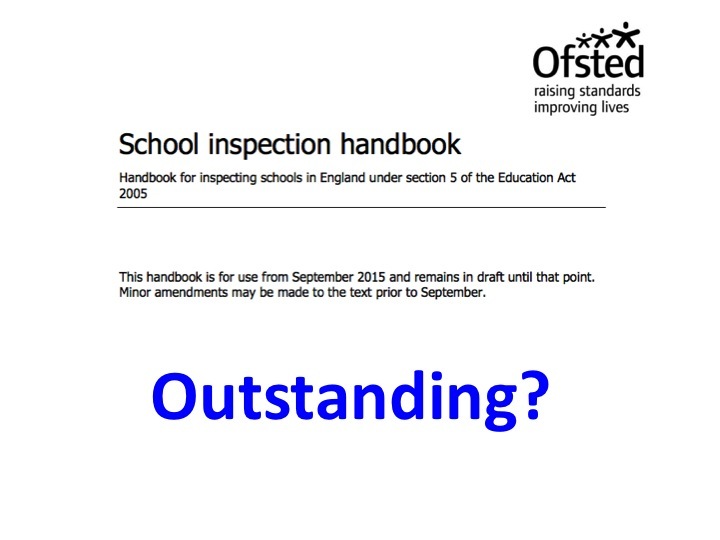 It’s helpful and important to note the list of clarifications from Page 10 – the things that OfSTED does NOT expect schools to do is spelt out. Also, it’s important to absorb the statement that is repeated throughout the handbook: Note: Grade descriptors are not a checklist. Inspectors adopt a ‘best fit’ approach that relies on the professional judgement of the inspection team.  The quality of teaching, learning and assessment is outstanding.  All other key judgements are likely to be outstanding. In exceptional circumstances one of the key judgements may be good, as long as there is convincing evidence that the school is improving this area rapidly and securely towards outstanding.  The school’s thoughtful and wide-ranging promotion of pupils’ spiritual, moral, social and cultural development and their physical well-being enables pupils to thrive.  Leaders and governors have created a culture that enables pupils and staff to excel. They are committed unwaveringly to setting high expectations for the conduct of pupils and staff. Relationships between staff and pupils are exemplary.  Leaders and governors focus on consistently improving outcomes for all pupils, but especially for disadvantaged pupils. They are uncompromising in their ambition.  The school’s actions have secured substantial improvement in progress for disadvantaged pupils. Progress is rising across the curriculum, including in English and mathematics.  Governors systematically challenge senior leaders so that the effective deployment of staff and resources, including the pupil premium and SEN funding, secures excellent outcomes for pupils. Governors do not shy away from challenging leaders about variations in outcomes for pupil groups, especially between disadvantaged and other pupils.  Leaders and governors have a deep, accurate understanding of the school’s effectiveness informed by the views of pupils, parents and staff. They use this to keep the school improving by focusing on the impact of their actions in key areas.  Leaders and governors use incisive performance management that leads to professional development that encourages, challenges and supports teachers’ improvement. Teaching is highly effective across the school.  Staff reflect on and debate the way they teach. They feel deeply involved in their own professional development. Leaders have created a climate in which teachers are motivated and trusted to take risks and innovate in ways that are right for their pupils.  The broad and balanced curriculum inspires pupils to learn. The range of subjects and courses helps pupils acquire knowledge, understanding and skills in all aspects of their education, including linguistic, mathematical, scientific, technical, human and social, physical and artistic learning.  Pupils’ spiritual, moral, social and cultural development and, within this, the promotion of fundamental British values, are at the heart of the school’s work.  Leaders promote equality of opportunity and diversity exceptionally well, for pupils and staff, so that the ethos and culture of the whole school counters any form of direct or indirect discriminatory behaviour. Leaders, staff and pupils do not tolerate prejudiced behaviour.  Safeguarding is effective. Leaders and managers have created a culture of vigilance where pupils’ welfare is actively promoted. Pupils are listened to and feel safe. Staff are trained to identify when a pupil may be at risk of neglect, abuse or exploitation and they report their concerns. Leaders and staff work effectively with external partners to support pupils who are at risk or who are the subject of a multi-agency plan.  Leaders’ work to protect pupils from radicalisation and extremism is exemplary. Leaders respond swiftly where pupils are vulnerable to these issues. High quality training develops staff’s vigilance, confidence and competency to challenge pupils’ views and encourage debate. Grade descriptor for the quality of teaching, learning and assessment.  Teachers demonstrate deep knowledge and understanding of the subjects they teach. They use questioning highly effectively and demonstrate understanding of the ways pupils think about subject content. They identify pupils’ common misconceptions and act to ensure they are corrected.  Teachers plan lessons very effectively, making maximum use of lesson time and coordinating lesson resources well. They manage pupils’ behaviour highly effectively with clear rules that are consistently enforced.  Teachers provide adequate time for practice to embed the pupils’ knowledge, understanding and skills securely. They introduce subject content progressively and constantly demand more of pupils. Teachers identify and support any pupil who is falling behind, and enable almost all to catch up.  Teachers check pupils’ understanding systematically and effectively in lessons, offering clearly directed and timely support.  Teachers provide pupils with incisive feedback, in line with the school’s assessment policy, about what pupils can do to improve their knowledge, understanding and skills. The pupils use this feedback effectively.  Teachers set challenging homework, in line with the school’s policy and as appropriate for the age and stage of pupils, that consolidates learning, deepens understanding and prepares pupils very well for work to come.  Teachers embed reading, writing and communication and, where appropriate, mathematics exceptionally well across the curriculum, equipping all pupils with the necessary skills to make progress. For younger children in particular, phonics teaching is highly effective in enabling them to tackle unfamiliar words.  Teachers are determined that pupils achieve well. They encourage pupils to try hard, recognise their efforts and ensure that pupils take pride in all aspects of their work. Teachers have consistently high expectations of all pupils’ attitudes to learning.  Pupils love the challenge of learning and are resilient to failure. They are curious, interested learners who seek out and use new information to develop, consolidate and deepen their knowledge, understanding and skills. They thrive in lessons and also regularly take up opportunities to learn through extra-curricular activities.  Pupils are eager to know how to improve their learning. They capitalise on opportunities to use feedback, written or oral, to improve.  Parents are provided with clear and timely information on how well their child is progressing and how well their child is doing in relation to the standards expected. Parents are given guidance about how to support their child to improve.  Teachers are quick to challenge stereotypes and the use of derogatory language in lessons and around the school. Resources and teaching strategies reflect and value the diversity of pupils’ experiences and provide pupils with a comprehensive understanding of people and communities beyond their immediate experience. Pupils love the challenge of learning. Grade descriptor for personal development, behaviour and welfare.  Pupils are confident, self-assured learners. Their excellent attitudes to learning have a strong, positive impact on their progress. They are proud of their achievements and of their school.  Pupils discuss and debate issues in a considered way, showing respect for others’ ideas and points of view.  High quality, impartial careers guidance helps pupils to make informed choices about which courses suit their academic needs and aspirations. They are prepared for the next stage of their education, employment, self-employment or training.  Pupils understand how their education equips them with the behaviours and attitudes necessary for success in their next stage of education, training or employment and for their adult life.  Pupils value their education and rarely miss a day at school. No groups of pupils are disadvantaged by low attendance. The attendance of pupils who have previously had exceptionally high rates of absence is rising quickly towards the national average.  Pupils’ impeccable conduct reflects the school’s effective strategies to promote high standards of behaviour. Pupils are self-disciplined. Incidences of low-level disruption are extremely rare.  For individuals or groups with particular needs, there is sustained improvement in pupils’ behaviour. Where standards of behaviour were already excellent, they have been maintained.  Pupils work hard with the school to prevent all forms of bullying, including online bullying and prejudice-based bullying.  Staff and pupils deal effectively with the very rare instances of bullying behaviour and/or use of derogatory or aggressive language.  The school’s open culture actively promotes all aspects of pupils’ welfare. Pupils are safe and feel safe at all times. They understand how to keep themselves and others safe in different situations and settings. They trust leaders to take rapid and appropriate action to resolve any concerns they have.  Pupils can explain accurately and confidently how to keep themselves healthy. They make informed choices about healthy eating, fitness and their emotional and mental well-being. They have an age-appropriate understanding of healthy relationships and are confident in staying safe from abuse and exploitation.  Pupils have an excellent understanding of how to stay safe online, the dangers of inappropriate use of mobile technology and social networking sites.  Pupils’ spiritual, moral, social and cultural development equips them to be thoughtful, caring and active citizens in school and in wider society.  Throughout each year group and across the curriculum, including in English and mathematics, current pupils make substantial and sustained progress, developing excellent knowledge and understanding, considering their different starting points.  The progress across the curriculum of disadvantaged pupils, disabled pupils and those with special educational needs currently on roll matches or is improving towards that of other pupils with the same starting points.  Pupils are typically able to articulate their knowledge and understanding clearly in an age-appropriate way. They can hold thoughtful conversations about them with each other and adults.  Pupils read widely and often across subjects to a high standard, with fluency and comprehension appropriate to their age. Children in Year 1 achieve highly in the national phonics check.  For pupils generally, and specifically for disadvantaged pupils and those who have special educational needs, progress is above average across nearly all subject areas.  From each different starting point, the proportions of pupils making and exceeding expected progress in English and in mathematics are high compared with national figures. The progress of disadvantaged pupils matches or is improving towards that of other pupils nationally.  The attainment of almost all groups of pupils is broadly in line with national averages or, if below these, it is improving rapidly.  Pupils are exceptionally well prepared for the next stage of their education, training or employment and have attained relevant qualifications. Compared with the national average for all pupils, higher proportions of pupils and of disadvantaged pupils, progress on to a range of higher and further education establishments, apprenticeships, employment or training. These destinations strongly support their career plans. Tom, I think you raise some excellent points here, particularly about the importance of not being Ofsted driven. From my time in the state sector I think this was a significant failing of schools (though I acknowledge there are deeper factors that drive that to be the case and thus culpability is shared). Below is an email I wrote to my staff on the day our recent Ofsted began and I think encapsulates my view of the inspection process. I am proud of the inspection report we received but I am more proud of the work which led to the report. schools must work towards providing a good education and trust that Ofsted will recognise that. I agree. Thus I wish to remind you all that our foremost duty over the next few days is to simply do what we always do, to stimulate and engage the students, to keep them safe, to serve as role models, and generally prepare them as best we can for a complex and challenging future. Please keep in mind that, Outstanding educational provision = an outstanding Ofsted. Not vice versa. Good luck to everyone over the next couple of days and please feel free to contact me at any point if you have questions queries, concerns or simply need to download. I do appreciate your blog — keeps me resonant and eager to resolve emerging issues.